Polycrystalline YBa2Cu3O7-d + x BaTiO3-CoFe2O4 (x = 0.0, 0.2, 0.4, 0.6 wt. %) superconductors were prepared by solid state route. 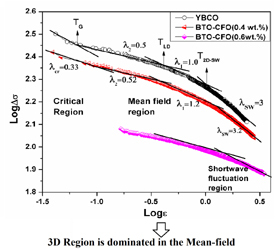 With the increase of BaTiO3-CoFe2O4 (BTO-CFO) addition it has been analyzed that the superconducting transition temperatures (Tc) determined from standard four-probe method was decreased and dropped sharply with higher wt. % addition of BTO-CFO. Excess conductivity fluctuation analysis using Aslamazov-Larkin model fitting reveals transition of two dominant regions (2D and 3D) above Tc. The decrease in 2D-3D crossover temperature TLD (Lawerence-Doniach temperature) in the mean field region has been observed as a consequent dominance of 3D region to increase in wt. % in the composite. The increasing value of ρwl (weak link resistivity) and ρn (0) (residual resistivity) and the decreasing trend in the value of zero-resistance critical temperature (Tc0) indicates that the connectivity between grains decreases gradually with the addition of magneto-electric composite BTO-CFO. The increasing value of αn (Percolation factor) and ΔTC signifies the increase in grain size and degradation of sample quality in the composites.